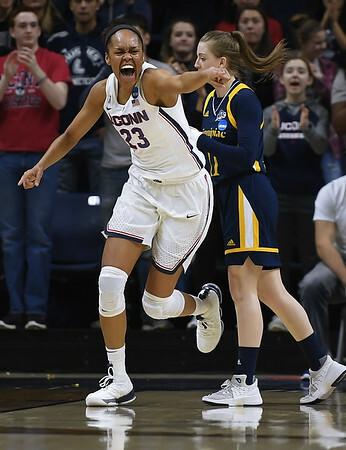 STORRS - Napheesa Collier scored 23 points and top-seeded UConn beat in-state neighbor Quinnipiac 71-46 on Monday night to advance to a 25th straight Sweet 16. Azura Stevens added 14 points and Kia Nurse chipped in with 13 for the Huskies (34-0), who found themselves in a much slower-paced game than their 140-52 first-round rout of Saint Francis (Pa.). But Connecticut was not threatened in this one either. They opened with a 9-2 run and never trailed. Jen Fay had 12 points to lead the ninth-seeded Bobcats (28-6), who saw their school-record 23-game winning streak snapped. Quinnipiac got plenty of open looks, but hit just four of 24 shots from 3-point range, including just one of 12 from in the first half. UConn shot 59 percent, held Quinnipiac to just 17 baskets on 56 shots (30 percent), and led 33-18 at halftime. A pair of free throws by Stevens gave the Huskies their first 20-point lead late in the third quarter and it was 54-31 going into the fourth. The Huskies were too big for the Bobcats, who had no player on the court over 6-foot tall. They outrebounded Quinnipiac 33-21 and outscored them 28-14 in the paint. It was just the second meeting between the two programs. The first, a 117-20 UConn win, came almost 20 years ago after Quinnipiac made the jump from Division II. Quinnipiac: Senior Carly Fabbri, the coach's daughter, finishes her career with a 112-26 record and three trips to the NCAA Tournament, where teams she was on went 3-3. ... This is the schools fourth trip to the tournament, all since 2015. UConn: The win was the Huskies 115th in their NCAA Tournament history against 18 defeats. The 86.5 winning percentage is the best in the history of the NCAA Tournament... UConn's current 34-game winning streak is the longest in the nation and 12th longest in NCAA history... UConn's seniors will end their careers undefeated (79-0) in Connecticut, including 32-0 at Gampel Pavilion. UConn plays either fourth-seeded Georgia or fifth-seeded Duke on Saturday in Albany, New York. The Huskies have not played a game outside the state of Connecticut since their penultimate win of the regular season at SMU on Feb. 24. Posted in New Britain Herald, UConn on Monday, 19 March 2018 20:58. Updated: Monday, 19 March 2018 21:14.